A petroleum worker was performing a refractory inspection inside the vertical section of a furnace stack when he slipped off a rope ladder and fell 13 feet, seriously injuring himself. The investigation found that while he was wearing personal fall arresting equipment, it failed to prevent his fall because it was improperly used. The equipment involved in the incident included a full-body harness, a six-foot lanyard with shock absorber, a rope grab and a vertical lifeline. It is suspected that the rope grab may have been improperly attached (reverse orientation) to the vertical lifeline. The employee lost his balance, fell, and the rope grab failed to arrest his fall because reverse orientation did not allow for the arresting mechanism to deploy. Even if the rope grab had been installed properly, the fall may still have occurred because the lanyard was longer than the manufacturer’s recommended length of four feet. Whenever there is a risk of a fall from an elevation, employers are required by law to provide their employees with the appropriate fall protection system. The employer is also required to ensure employees are instructed and trained in the proper use and care of the protective equipment, fall protection system for the area, the post-fall rescue procedure and, where applicable, the fall protection code of practice. 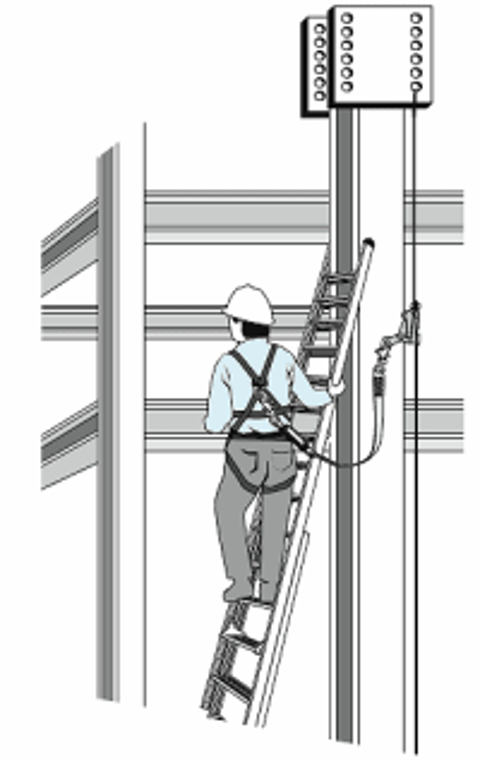 The law requires that employees continually use the fall protection system as instructed. The law also requires that equipment be used as directed by the manufacturer. This information is usually found in the user’s manual or on the equipment itself. If unsure of the proper use of the equipment, you must contact the manufacturer for clarification.